Chill-Its Low Profile Hydration Pack can keep you hydrated when you are away from water sources for an extended period of time. 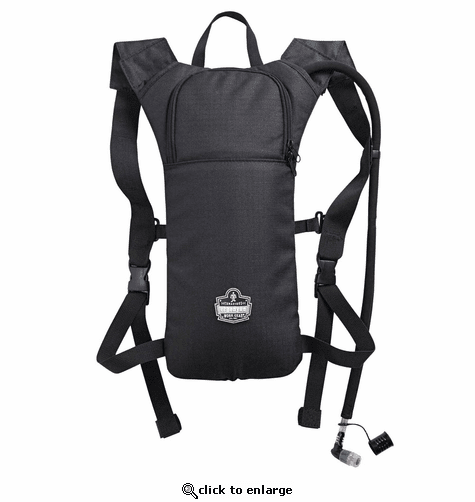 If you are planning a long day working outside, on the beach, at a baseball game, or just don't feel like carrying a water bottle, you can use this handy backpack-style water source to keep your essential hydration liquids close at hand. Using The Pack: Place arms through the shoulder straps. Adjust straps for proper fit and secure loose straps. Store extra tubing inside pack. Bite and sip to drink. Filling The Reservoir: Unscrew cap. Fill with water. Add ice if desired. Seal cap. Cleaning: Remove reservoir from pack. Clean with mild soap and hot water. Dry with reservoir open. For best results, use bottle brushes to scrub inside of reservoir and tube. To freshen, soak with baking soda (2 teaspoons + water). Rinse thoroughly. To sanitize, soak with bleach (2 tablespoons + water). Rinse thoroughly.To wash pack, remove reservoir. Machine wash cold.